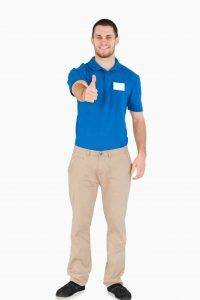 How Uniforms Can Boost Employee Motivation | Ace Uniform Services, Inc. When employees wear uniforms, they all become part of a consistent and coordinated team. Many components work together to create a supportive, productive, and harmonious work environment. These include a clear set of goals, positive reinforcement, and even employee uniforms. Even the clothing that employees, where to work, can influence the way they perform and interact with each other. For more insight on this topic, read on to discover how uniforms can boost employee motivation. When employees wear uniforms, they all become part of a consistent and coordinated team. This means that, when the time comes for performance to be evaluated, it can be based entirely on work ethic and conduct rather than appearance. Furthermore, as people come from different socioeconomic backgrounds, they have access to the various styles of clothing. Employee uniforms eliminate the need to purchase a wardrobe for work. They only need to focus their energy on keeping their uniforms clean and orderly. Also, employee uniforms take away the visible hierarchy. When everyone is dressed the same, they feel equal to their peers. Employee uniforms take away distractions. With everyone wearing the same or similar clothing, there will be no need to make comparisons. Depending on the industry, uniforms will also increase comfort while performing the tasks of the job. Many uniforms are designed specifically to make it easier for employees to do their jobs. For example, people who work in hot kitchens often wear cool and lightweight clothing while people who have to work outside in the cold will wear insulated uniforms. Seeing that your peers are wearing the same or similar clothing to you at work helps enhance the sense of identity among peers in the workplace. People can better understand that they are working alongside their peers to achieve common goals for the business and themselves. The uniforms also help new employees develop a rapport with others faster. You’re not just an employee; you are a brand representative, and uniforms drive that point home. Wearing uniforms that feature company colors or logos help employees transition from their personal lives to being on the clock. Employees also become easily identifiable to customers, when they can quickly provide assistance and answer questions. This entry was posted on Friday, April 20th, 2018	at 2:10 pm	. You can follow any responses to this entry through the RSS 2.0	feed. Both comments and pings are currently closed.